The magazine’s number of subscriptions surged during the Great Depression, and again during World War II. During this time, noted critic and former Vanity Fair editorFrank Crowninshield served as its editor, having been moved over from Vanity Fair by publisher Condé Nast. Laird Borrelli notes that Vogue led the decline of fashion illustration in the late 1930s, when they began to replace their celebrated illustrated covers, by artists such asDagmar Freuchen, with photographic images. In the 1960s, with Diana Vreeland as editor-in-chief and personality, the magazine began to appeal to the youth of the sexual revolution by focusing more on contemporary fashion and editorial features that openly discussed sexuality. Toward this end, Vogue extended coverage to include East Village boutiques such as Limbo on St. Mark’s Place, as well as including features of “downtown” personalities such as Andy Warhol, “Superstar” Jane Holzer‘s favorite haunts. Vogue also continued making household names out of models, a practice that continued with Suzy Parker, Twiggy, Jean Shrimpton, Lauren Hutton, Veruschka, Marisa Berenson, Penelope Tree, and others. Anna Wintour became editor-in-chief of American Vogue in July 1988. Noted for her trademark bob cut and sunglasses, Wintour sought to revitalize the brand by making it younger and more approachable;she directed the focus towards new and accessible concepts of “fashion” for a wider audience. Wintour’s influence allowed the magazine to maintain its high circulation, while staff discovered new trends that a broader audience could conceivably afford. For example, the inaugural cover of the magazine under Wintour’s editorship featured a three-quarter-length photograph of Michaela Bercu, an Israeli super model, wearing a bejeweled Christian Lacroix jacket and a pair of jeans, a departure from her predecessors’ tendency to portray a woman’s face alone; according to the Times, this gave “greater importance to both her clothing and her body”. As fashion editor, Grace Coddington wrote in her memoirs, the cover “endorsed a democratic new high/low attitude to dressing, added some youthful but sophisticated raciness, and garnished it with a dash of confident energy and drive that implied getting somewhere fast. 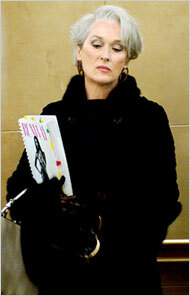 It was quintessential Anna.” Wintour continues to be American Vogue ‘ s editor-in-chief to this day. In 2009, the feature-length documentary The September Issue was released; it was an inside view of the production of the record-breaking September 2007 issue of U.S. Vogue, directed by R. J. Cutler. 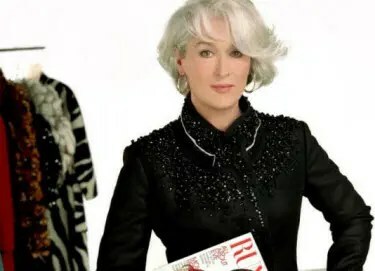 The film was shot over eight months as Wintour prepared the issue, and included testy exchanges between Wintour and her creative director Grace Coddington. The issue became the largest ever published at the time; over 5 pounds in weight and 840 pages in length, a world record for a monthly magazine  Since then, that record has been broken by Vogue’s 2012 September issue, which came in at 916 pages. Also in 2012, HBO released a documentary entitled In Vogue: The Editor’s Eye, in conjunction with the 120th anniversary of the magazine. Drawing on Vogue ‘ s extensive archives, the film featured behind-the-scenes interviews with long time Vogue editors, including Wintour, Coddington, Tonne Goodman, Hamish Bowles and Phyllis Posnick. Celebrated subjects and designers in the fashion industry, such as Nicole Kidman, Sarah Jessica Parker, Vera Wang, and Marc Jacobs, also appear in the film. The editors share personal stories about collaborating with top photographers, such as Leibowitz, and the various day-to-day responsibilities and interactions of a fashion editor at Vogue. The film was directed and produced by Fenton Bailey and Randy Barbato. In October 2012, Vogue also released a book titled Vogue: The Editor’s Eyeto complement the documentary. Jacki Kellum is a Fine Artist, a Designer, and also a writer. For one of her graduate programs, she wrote her thesis on William Blake. Like Blake, much of Kellum's work is about childhood and lost innocence. Also like Blake, Kellum strives to both write and illustrate her work. . This entry was posted in Anna Wintour, Devil Wears Prada, Metropolitan Museum Costume Institute, September Issue, Vogue Magazine and tagged Anna Wintour, Devil Wears Prada, History of Vogue Magazine, Metropolitan Museum Costume Institute, September Issue, Vogue Magazine. Bookmark the permalink.